Vases of this type were made for a long period of time, with shape and design gradually deteriorating in precision. The present piece is a fairly late example, from the second half of the 13th century. 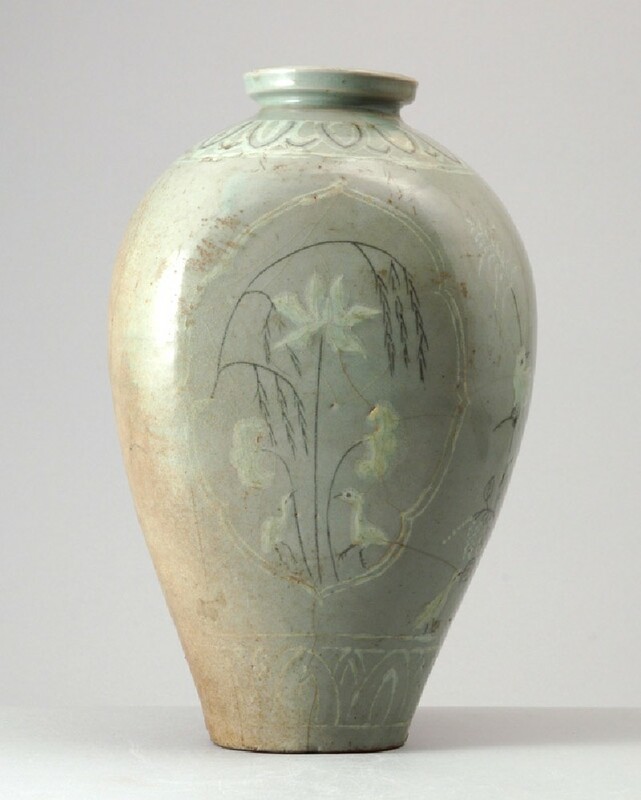 The vase is of maebyong form, with a wide rounded shoulder, a narrow base with shallow footring, and a wide mouth with everted angular rim. Rim and base are of circular section but the body has been squeezed to create a flat front and back. Both are inlaid with a sketchily rendered design of water birds among lotus under overhanging willow, enclosed in a quatrefoil barbed panel with twin white outlines. The birds, lotus blooms and leaves are inlaid in white, the willows and the birds’ beaks, eyes and legs as well as the lotus stalks are inlaid in black. The narrow sides of the vase are decorated with further inlaid bird-and-flower designs, one side showing a long-tailed pair of birds perched among fruiting and flowering stalks, naturalistically rendered with one branch partly broken, with two further birds on the ground, picking at white berries. On the reverse the design is obliterated, perhaps by ash settling on the glaze during firing. The shoulder and base are inlaid with pendant and upright petal borders, the former in black and white, the latter in white only. The light green glaze is of fine blue-green tone inside the rim, paler around the sides and misfired on one side. The footring and much of the base are free of glaze and the body has fired a reddish-brown tone. Similar pieces have been discovered at Yuch’ŏn-ri, Poan-myon, Puan-gun, Chŏlla-pukdo.